Publication News: That All May Flourish — Jennifer L. Phillips, Ph.D. I am pleased to announced that I have published two chapters in That All May Flourish, a comparative ethics text that considers the diverse ways religions are responding to climate change, new technologies, and the imperative of ecological stewardship. My first chapter, “Flourishing in Crisis,” builds on my doctoral dissertation and examines these issues through the lens of Catholic social thought, including the most recent writings of Pope Francis. The second is a dialogue chapter, co-authored with Jewish ethicist Rebecca Epstein Levi, in which we consider the shared values, tensions between, and feminist aspects of our ideas. 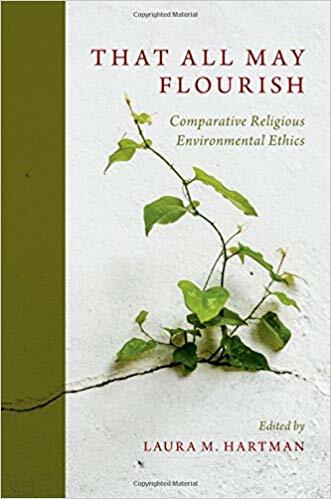 That All May Flourish: Comparative Religious Environmental Ethics, Oxford University Press, 2018. Can humans flourish without destroying the earth? In this book, experts on many of the world's major and minor religious traditions address the question of human and earth flourishing. Each chapter considers specific religious ideas and specific environmental harms. Chapters are paired and the authors work in dialogue with one another. Taken together, the chapters reveal that the question of flourishing is deceptively simple. Most would agree that humans should flourish without destroying the earth. But not all humans have equal opportunities to flourish. Additionally, on a basic physical level any human flourishing must, of necessity, cause some harm. These considerations of the price and distribution of flourishing raise unique questions about the status of humans and nature. This book represents a step toward reconciliation: that people and their ecosystems may live in peace, that people from different religious worldviews may engage in productive dialogue; in short, that all may flourish.